With MK Jackie Levy leaving the Knesset after being elected mayor of Beit She'an, Attorney Osnat Mark has become the newest Likud MK in the Knesset. MK Mark spoke to Arutz Sheva about the goals she sets for herself, her positions and future political plans. She said that she ran her law firm in the past three years in a "state of readiness" to enter the Knesset in the event that one of the Likud MKs resigned from his or her post. 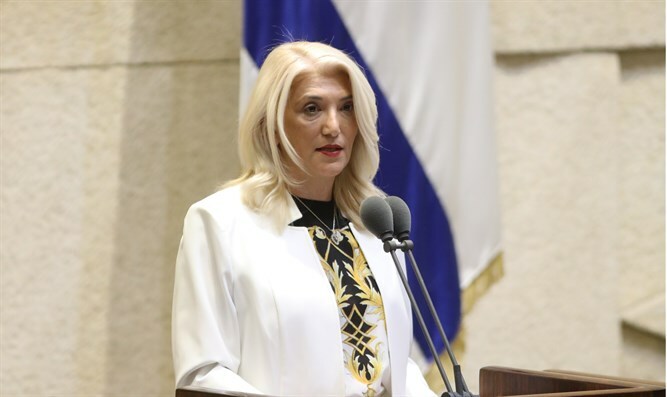 As a resident of Ma'ale Adummm, MK Mark sees the application of Israeli sovereignty over Ma'ale Adummim as an immediate goal for herself in her political activity, as she herself said from the Knesset podium in her first speech. She noted that she views Judea and Samaria as areas that are very important to her heart. Mark seeks to apply Israeli sovereignty over all of Judea and Samaria, with Ma'ale Adumim only the first step in this direction. On the peace process, Mark said that before any proposal can be considered, the intentions of the Palestinian Authority. According to her, as long as the PA continues to prove that it is not interested in peace, there is no reason to pursue any agreement with them. Mark said she will also seek to raise the issues of Israeli small business owners in the Knesset. "I am going to take care of the small business conditions, which is a very important issue. There are many families in Israel who make their living from small businesses and the subject is not being sufficiently dealt with." When asked to present an example of the needs of small business owners, it raises the fact that current the income tax and VAT do not reflect the expenses of a small business owners. According to her, it is possible to advance the moves in favor of small businesses during the current term, despite it entering its final year and the possibility of early elections. "Anyone who knows me knows that I am a very diligent person. I know how to quickly bring about both large and small moves, learn a subject and go into it deeply."